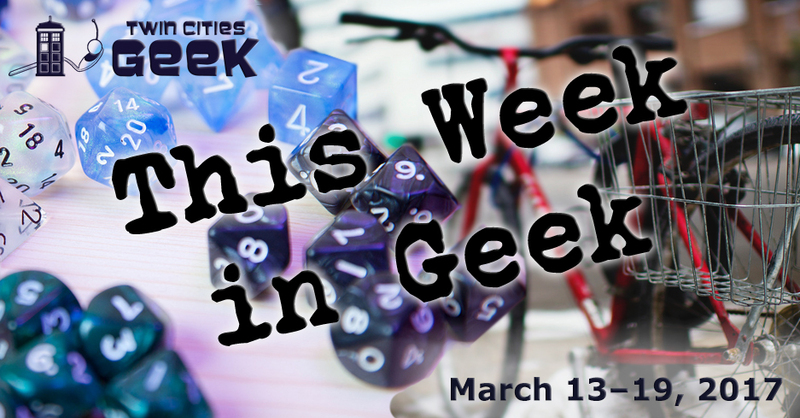 Welcome to This Week in Geek, your guide to events of interest to the Minnesota geek community for the week of Monday, March 13th through Sunday March 19th. When: Monday, March 13th, Friday, March 17th, and Saturday, March 18th at 7:30 p.m.; Sunday, March 19th at 2:30 p.m. When: Tuesday, March 14th at 6:15 p.m.
Books and Bars is an “open public book club show” hosted and moderated by Minnesota Public Radio senior producer Jeff Kamin that provides attendees with “a unique atmosphere for a lively discussion of interesting authors, fun people, good food, and social lubrication.” The book being read and discussed this month is The Name of the Wind by Patrick Rothfuss. When: Tuesday, March 14th at 7:00 p.m.
Geek Date Night is hosting a screening of Leprechaun at Clubhouse Jäger. Compete in premovie trivia with Rob Callahan at 7:00 for a chance to win a $50 bar tab, then stay at 9:00 for a screening of the ultimate in Friends prequels. MinnSpec presents the East Saint Paul Speculative Fiction Meetup, a meetup for writers of speculative fiction. The topic of discussion for the evening will be Pixar’s 22 rules of storytelling. Additionally, see the meetup site for details of writing submissions and critique. The North County Gaylaxians present a discussion of John Varley’s Steel Beach at the Quatrefoil library. Steel Beach is a science-fiction epic from Hugo and Nebula Award–winning author John Varley that examines humanity on the brink of profound change after being forced from the earth by an alien invasion. When: Tuesday, March 14th at 7:30 p.m.
Stay safe from the Ides of March with this night of experimental comedy from Fearless Comedy Productions. This is a pay-what-you-like show and features performers who you’ll see at the Die Laughing 50-hour comedy marathon. Have some laughs, have a drink, and enjoy a mix of improv, stand-up, music, storytelling and stuff that’s harder to categorize. When: Wednesday, March 15th at 5:00 p.m.
Twin Cities Girls Pint Out is raising money for Alexandra House, an emergency shelter offering domestic advocacy with beer at Clockwerks, a downtown Minneapolis brewery with a steampunk sensibility. Be social and socially conscious while enjoying fine craft beer. When: Wednesday, March 15th at 7:00 p.m.
Trash Film Debauchery presents a screening of Pontypool, a horror film about small-town Ontario and a deadly virus. This film will be screened at the Trylon Microcinema in Minneapolis, and due to the limited space at the venue, reserving seats ahead of time is encouraged. When: Thursday, March 16th at 6:30 p.m.
Geek Physique is partnering with White Tiger Martial Arts Basic for two classes, one focused on Korean sword arts and the other on tae kwon do and basic self-defense. This is the second of 11 sessions. Admission is free, and participants must be at least 12 years old. The Geek Partnership Society’s Crafty Geek club and its sub-club Make It Sew meet Thursday evenings at the Waterbury Center and invite you to “bring your crafty stuff to do” or to “hang out and work with the crafty stuff we have here!” This week the special focus will be on calligraphy. When: Thursday, March 16th at 7:00 p.m. Drinking with Geeks is hosting a social get-together at Black Forest Inn for “Twin Cities nerdarati,” which of course means you if you’re reading this. This is an open event. Come to this class from the Minnesota State Horticultural Society and learn what you can do to identify and support bees in their natural setting. See the beauty and diversity of bees in a series of photos while learning about behavior, habitat, and what you can do to help. Light snacks will be served. When: Thursday, March 16th at 7:30 p.m.
Mia’s free Third Thursday event this month includes entry to At Home with Monsters, spooky synth-wave music from local band Graveyard Club, makeup demonstrations, and more. Click here for our article on At Home with Monsters, which runs through May 28. When: Thursday, March 16 at 7:00 p.m. When: Friday, March 17th at 6:00 p.m. When: Friday, March 17th at 10:00 p.m.
Paganicon is a weekend-long Pagan conference with panels, workshops, music, vendors, a ball, and more. The event is hosted by Twin Cities Pagan Pride and aims to provide a venue for Pagans, Wiccans, Heathens, Druids, and others. See the event site for more details on tickets and individual events. When: Friday, March 17th at 7:00 p.m. When: Friday, March 17th, and Saturday, March 18th at 7:30 p.m.; March 19th at 2:30 p.m.
Puppet Lab is returning for a sixth year of experimental puppet theater from new voices. This event will run for two weekends, with the first (March 17–19) focusing on works by Chamindika Wanduragala and Madeline Helling and the second (March 24–26) on Patty Gille and Allison Osberg. See the event page for details and tickets. When: Saturday, March 18th at 10:00 a.m. The Walker Community United Methodist is hosting a vintage science fiction fan’s dream sale. Come by to find books and magazines from the ’40s, ’50s, ’60s and newer. Who knows what you’ll find? When: Saturday, March 18th at 4:00 p.m.
Join the Alliance Française of Minneapolis and Saint Paul to learn terms from Wolof, the national language of Senegal, while enjoying Ataya, a Senegalese tea. Tickets are $10 for Alliance Française members and $15 for nonmembers. When: Sunday, March 19th at 12:00 p.m. This is the third of a three-part series on cosplay and focuses on bringing your work to the stage and presenting it in front of others. This is a free event and will help to prepare the curious to bring their work to the masquerade stage. The event is hosted by CONsole Room. When Sunday, March 19th at 3:00 p.m. The Minnesota History Center and the Trylon present Timepieces, a new screening series in which movie buffs and history lovers introduce films that showcase a particular era. For this screening, fashion designer Samantha Rei will be introducing 1995’s Tank Girl, which plays on ’90s concerns like the fall of the Soviet Union.